Zero to 60 Designs – the world-class design, engineering and fabrication studio that debuted the performance-packed and widely celebrated GTT supercar at this years’ 2016 SEMA Show in Las Vegas, has announced its official pricing and production timeline for the GTT. Although Zero to 60 has been taking initial pre-orders, demand has already exceeded expectations as Job #1 begins in January 2017. Zero to 60 will move its initial limited production number from 25 to 50 units. 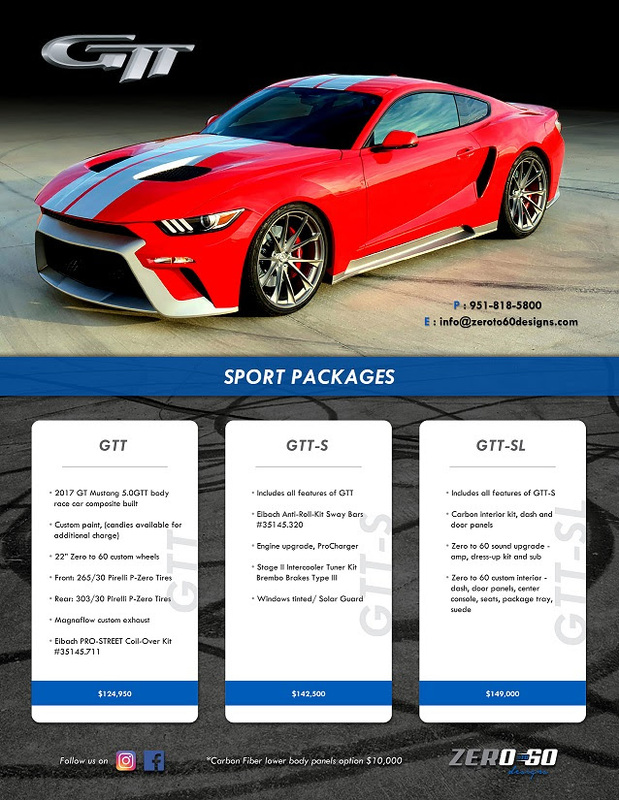 Pricing for the GTT is highly competitive, especially given the performance upgrades and custom exterior design that set the GTT apart from any other vehicle on the road. Production starts in January 2017. The GTT will come in three different trim levels and offered to the consumer. Specific part numbers can be provided. The GTT will serve as the base foundational model. With the stock Ford Mustang GT 5.0L Coyote Motor, the GTT engine will be mated with a custom Magnaflow exhaust and mounted on custom in-house Zero to 60 wheels. Keeping the GTT firmly planted to the road or track, Pirelli P-Zero performance tires will provide incredible traction and Eibach PRO-STREET Coil-Over kit will provide enhanced handling and stability while cornering. The GTT Body Race Car Composite exterior the industry has fallen in love with will be included on all three trim levels. Customers will be able to handpick their own custom color. The GTT-S will see significant enhancements that increase overall performance of the GTT. Under the hood, the engine treatment will include a supercharger powered by Procharger. Horsepower will be increased substantially. Suspension refinement continues with an Eibach Sway Bar being added for track performance. With increased horsepower and all-out performance stopping power is a must.Brembo will provide incredible braking power for the GTT-S with purpose-built brakes. Solar Gard Window Protection will provide enhanced tinting with an SPF 186+ rating. Zero to 60 Designs top trim level for the GTT is the GTT-SL. This is the ultimate in both interior and exterior custom design with all-out performance. The GTT-SL will receive all of the above upgrades but will also see further enhancements to the brakes, interior and sound system. The top trim level will receive Brembo 6 piston front and cross-drilled rotors for track performance. The interior will see all-new carbon fiber interior with dash and door panel inlays. Custom performance seats, center console and package tray will also be custom. The speaker system gets cleaner and louder with a full sound system upgrade with amplifier. The icing on the cake are Zero to 60 trim rings and grille that provide the last touch of individual uniqueness.